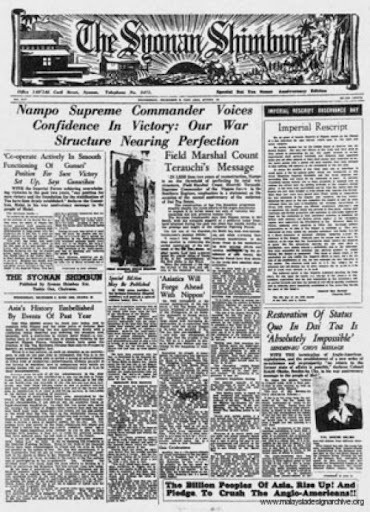 The Straits Times became known as The Shonan Times and The Syonan Shimbun (abbreviated to SS) five days after the British surrender to the Japanese. The original “The Syonan Shimbun”, a Japanese-owned paper during the war years in Malay, carried many propaganda articles or stories which put the Japanese in a favourable light. This article, written by a “Syonan Shimbun Staff Reporter” states that the Fuji Village which the Japanese ordered the Eurasians to create at Bahau in Negri Sembilan, is well on its way to success. The clocks were put forward by 1½ hours in line with Tokyo time. Major newspapers, including The Straits Times, were taken over by the Japanese, and radio broadcasts were made up mainly of Japanese propaganda and cultural programmes. The Japanese language was introduced in schools, and the Japanese currency, replaced the British currency. It later became known as valueless “banana money”. Update: 5 September 1945, when Singapore returned to British rule, the name change back to The Straits Times. This is a good tip particularly to those new to the blogosphere. Brief but very accurate information… Thank you for sharing this one. A must read article!